I'm a Software Engineer specializing in Computer Security. I am a member of the Silicon Valley Boardgaming Group which meets at the Rengsdorf Park Community Center in Mountain View, CA on Tuesday nights and also sponsors the So Bay Area Gamedays. I've worked on several game ideas over the years, but have not tried to get any published, but would like to. My favorite piecepack game (not my own) is AlienCity. My current favorite commercial games are Race for The Galaxy, Power Grid (Funkenschlag) and Age of Steam. I collect vintage and current railroad themed games of all types. My other hobbies are Origami, Japanese Anime and Manga, Comic Books, Science Fiction and collecting rocks and fossils. My whole extended family plays games and most family gatherings are non-stop gaming sessions. As of August 2004 there are updated versions of all my games up on the BigBoard. (1) My way to play this classic game using a piecepack. 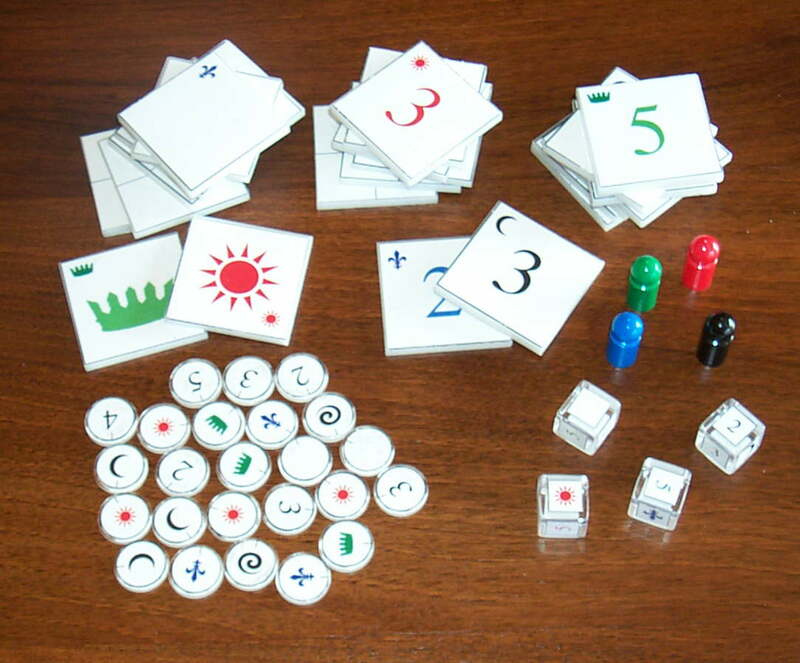 (2) This game was originally designed by Alex Randolph and adapted by me for the piecepack. (3) GlobalWarming was co-written with my sister Gloria Wall and her son Aron. (4) Flicking game. Most of my flicking games require a smooth seamless-surface table of at least 8 sq feet and at least 4 ft in one dimension. (5) Requires a playing surface of at least 2 ft by 4 ft.
(6) Runner up in the HistoryRepeatsItself contest. (7) Entry in the ChangingLandscapes contest. (8) One of the RecommendedGames. (9) Entry in the SolitaryConfinement contest. (10) movement system based on my essay below. A discussion on using piecepack coins for Roborally like programmed movement games. The tiles are 2" x 2" x 3/16" opaque white Plexiglas. The coins and cubes are clear acrylic. The pawns I got from Cheapass Games. I got the downloadable PDFs color laser printed on 8" x 11" Avery labels at Kinkos, cut them out and stuck them on.